At Zane's school, they take pictures of the kids engaged in art activities. I'm missing out on huge chunks of my son's life while I'm a slave to a paycheck, so I like this idea. It would be nice if more classrooms did this, but considering the general lack of funding for education, I'm not holding my breath. The teachers ask the kids about what they are working on and type that up as a quote to go with the picture. That's where I get sidetracked, because often the quote does not match the picture at all. 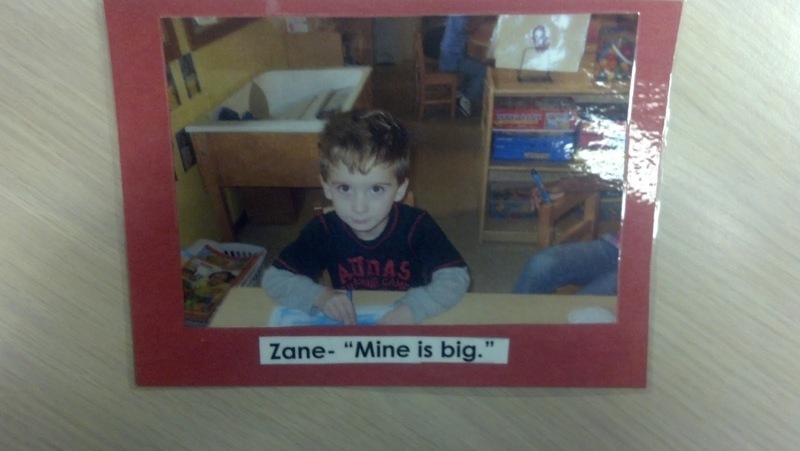 In the picture above, for instance, Zane is coloring an unidentifiable picture, and he says, "Mine is big." What the heck is that boy talking about? What, exactly, is big? The picture? Is this some sort of new four-year-old slang? I don't get it. I used to get it. I hate that I don't get it. Is this what I have to look forward to, this not having a clue what is going on? I used to pride myself on being able to figure things out, but apparently that ship has sailed. I am afraid that one day soon I will be sitting in a room, surrounded by teenagers, and be unable to understand a word any of them say. Get used to it, girlfriend! Not understanding the young ones is part of the aging process!!! It's all downhill from here!! Seriously, can't you just ask him?? I did ask him, and he didn't know either! That made me feel a little better. I have no idea either. But Lord, he's a cutie!!! Great idea from the teachers, but you would think they might've expanded on that one a wee bit for you!